Supercar enthusiasts went into a tizzy when Honda announced at the Detroit auto show that it would bring its Acura NSX back to life. And not only that. Design would be shifted from Japan to Honda’s Center of Research and Development in Ohio. Manufacturing would be shifted to Ohio as well. And a portion of the production would be exported. While the NSX won’t add much volume to Honda’s production in the US, it will be a technology showcase—and another precursor that the math of manufacturing in America is changing. The mid-engine NSX was built by hand in Japan from 1990 to 2005. Of the 18,000 units produced during its 15-year production run, half landed on our shores. It won accolades from the automotive press, including “Best sports car ever built” by Motor Trend in 1991—though it had a smallish engine by supercar standards and wasn’t as fast as some of its brethren. Honda also built racing versions, the NSX-R and NSX-R GT. And in an epic product placement success, the NSX was featured in the 1994 movie Pulp Fiction. Now the next generation will be designed and built in the US. There have been other recent examples of automakers announcing that they would shift export-oriented production to the US—for two-edged economic reasons. The weak dollar. It’s particularly alluring for Japanese manufacturers as they’re struggling with the strong yen. In that respect, the war that the Fed has waged on the dollar is paying off, so to speak, though it made life more expensive for Americans by inflating prices of imports, including oil and consumer products. Even the euro, despite its gargantuan crisis, is hovering in the middle of its trading range against the dollar. Low wages. Since 2000, inflation-adjusted wages have declined by around 10%. The White House came out with a paper that bragged about lower wages as a boost to manufacturing. The paper was addressed to the business community, obviously, and not to the rank and file who bore the brunt of the declining wages. Manufacturing has been a horrid multi-decade saga. Since 2000, another six million manufacturing jobs were lost. 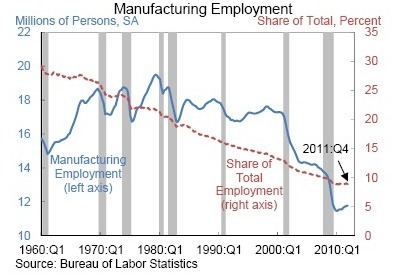 The hope is that it bottomed out in 2010, when only 8% of all jobs were still in manufacturing. This graph is from the White House paper. The tiny hook at the bottom, that’s the recent upswing. So maybe the hook is a turning point. Auto manufacturing costs in the US—especially if transportation is included—have been competitive with those in Europe, Japan, and Korea for a long time, and most major automakers have large production plants in the US. 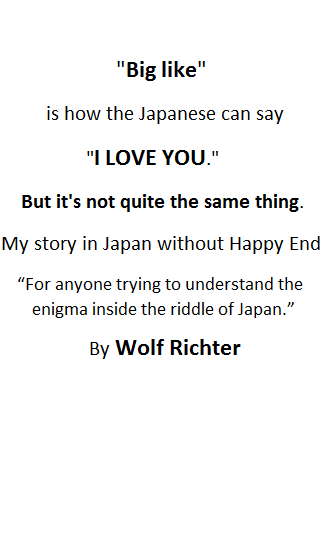 But the new competition isn’t Europe or Japan. Or even Mexico. It’s China. Which begs the question: to what banana-republic levels will real wages still have to sink? Yet, Honda’s decision to transfer design and manufacturing of its showcase supercar from Japan to the US is significant. The NSX will be produced in small numbers—if history is any guide, between 1,000 and 2,000 vehicles a year. Much of the assembly will be done by hand and will require a highly skilled, productive, and flexible work force. Honda’s decision is a vote of confidence. By contrast, Honda announced last August that it would build a plant in Mexico able to produce 200,000 subcompacts per year. Nissan made a similar announcement last week. The lure of cheap labor elsewhere is still strong. Apparently, American wages aren’t quite there yet. And for Japan, the NSX decision is another detail in a somber scenario in which the pace of offshoring is gaining momentum.